Food will always be a part of me. Thus, no one (or nothing) can stop me from writing about these food places I would always look forward to dining in again. I love Iloilo because of the very affordable hotel accommodations (Westown’s my favorite), batchoy (I can eat batchoy all day when I’m in Iloilo) and JD! No, not Johnny Depp, but I do adore that man. I’m talking about JD Bakeshop. You must love their pastries! They have branches all over Iloilo City but don’t forget to bring home some of these delicious sweets when you get to the airport. My favorite is the carrot cupcake. They’re not that sweet, but very tasty. We discovered JD one early morning flight. I was traveling to Cebu with our two VPs. 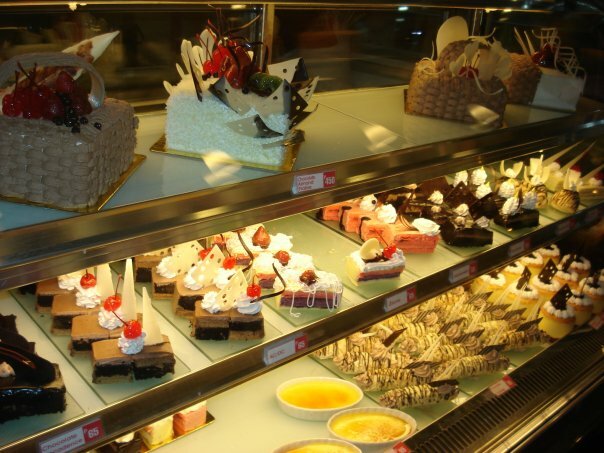 We were elated to discover a pastry shop selling a variety of sweets at a very affordable price…in the airport! We ended up buying boxes of the carrot cupcakes and revel bars not minding the hassle of carrying them to our stopover (we had to attend a meeting) in Cebu. I long to go back to Iloilo just for these delicious treats. They also serve meals, by the way. Real Italian cuisine—that’s Bellini’s (not that I’ve been to Italy). Heck, the owner, Signor Bellini, was a paparazzo before! How real could you get? He’s a very friendly old man, going around to ask you how’s the food and to check if everything’s okay. He even complimented us with glasses of red wine during our first visit. Their pizzas, I suppose, are cooked and served the Italian way. They serve it with oil with spices, not tomato sauce or catsup. I love their pastas and desserts. Try their Nero Tartufo and Pharaoh’s Delight on your visit. It’s located at the Cubao Shoe Expo, together with really cool vintage shops. Bellini’s is ideal for casual dining with friends and romantic dates. I scream for Sampaguita Ice Cream! I accidentally stumbled upon Ilustrado in SM Makati when I had to meet a friend for a chat. When in Makati, I always go to Tsoko.nut Batirol for their Iced Banana Batirol. I’ve been there a lot of times but I just couldn’t remember what floor it is located at. We missed it by one floor and discovered Ilustrado. I’ve always wanted to try this popular (among wedding coordinators, at least) restaurant, but I just couldn’t find a time to go to their branch in Intramuros. I already know that they have a branch in Makati but I didn’t know it’s in SM Makati until that day. And, boy, I was so excited seeing their logo as we got off the escalator. “Sampaguita ice cream!” I think I screamed to my friend who, for one moment, didn’t know what has happened. Before taking our seats, I asked if they have the sampaguita ice cream. Since I saw it in a feature on TV, I’ve always wanted to try this weird ice cream flavor. And to finally getting a chance to try it, I had to be sure they’re serving it. It’s a pricey café, and I could just walk away if they’re not serving what I want. Luckily, sampaguita ice cream was available that day. Yey me! 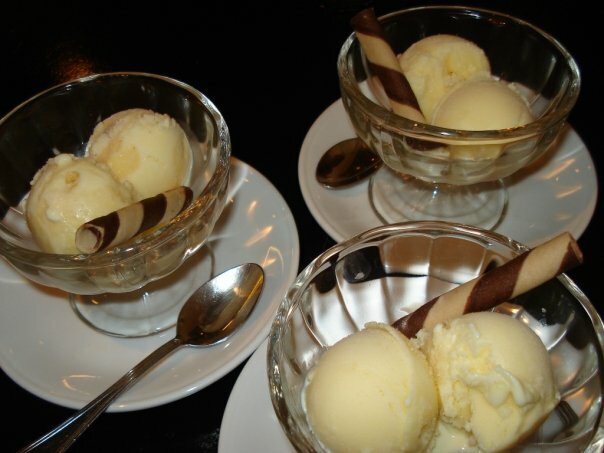 Their sampaguita ice cream is enough reason to try this restaurant. But you can also try their Pasta Supremo. It’s a unique pasta flavor inspired by the taste of real Pinoy cuisine. It has eggplant! Back to sampaguita ice cream. It was sooooo good! You might feel awkward at first. It’s like eating fragrance. The ice cream doesn’t have smell, but you can feel the fragrance of sampaguita as you devour the two creamy scoops they serve. It costs less than a hundred pesos. I finally got a chance to go to the Ilustrado branch in Intramuros one December day when we decided to rediscover the historical place. The sampaguita ice cream they serve is a bit more expensive and they only serve one scoop per order. A rip-off, yes, but the ambience is so worth it. Bring someone here for a special occasion. If you’re in the mood for a Japanese buffet and you’re tired of the usual Saisaki and sushi conveyor belts, this is a very affordable treat. It’s one of my favorite buffet places because you don’t have to get up to go to the buffet table to get food. They serve it on your table. Convenient, eh? Hey, I’m paying good money, I want every convenient way to eat that a resto could offer. It was one of my friends’ birthday treat and the Metro had just been left battered by Ondoy, and there we were eating at one of the restos that serves food like there’s no tomorrow. Okay, I admit it. I didn’t enjoy that much when we had dinner here. I felt guilty that a lot of people lost their homes and there we were sitting comfortably even if the waiter prompted us as we sat that there could be power failure. Anyway, the key to enjoy dining here is to befriend your waiter. Ours brought us freshly grilled food even if we had our yoyo in a red signal, which means stop, of course. He was polite to ask us if we care to try the new ones. My favorites have to be the schublig and chicken fillet. Brazil! Brazil! Is not really for people on diet or for those who eat little like me. Brazil! Brazil! Is for the hungry ones… and by “hungry”, I mean really hungry. Their Orange Poppy Seed (OPS) muffins are my favorite snack. I became addicted to these little sweets because they are always sold-out. Or maybe it’s the poppy seeds? I don’t really know. I think it’s my mind’s working. You know, because there were a lot of times that I went to their store to find out there’s no OPS left, I regard it as somehow “unattainable”, so I should get some! I want them! Yes, I have a thing for “unattainables”. A friend from work introduced me to this restaurant that is inspired by “The Godfather”. Their staff looks like a bunch of mafia people. I think they are waiters during the day and bouncers at night. But they are friendly, I can assure you that. We love their seafood pasta and “The Godfather” pizza. Ask for the special sauce they use for red pastas and use it for the pizza. Really yummy! It’s affordable, too. I prefer this over Amici. Again, if I’m paying good money, I want convenience as it’s finest! Amici is self-service. Their caramel cake is extraordinary. If you like leche flan, you’d love their cakes too. It’s made-to-order, though. You have to call to place an order and pick it up from their store in Quezon City. For contact details, click. My favorite breakfast when traveling is definitely from this coffee shop. Not only because it’s conveniently located inside the airport, but also it’s competition is Delifrance. I’d rather go for something I don’t usually see outside the airport. And so, Ya Kun wins! I don’t eat soft-boiled eggs, but there’s something about Ya Kun’s eggs that I love them. Serve with their signature Singaporean coffee and French toast with the sweet jam, called kaya. It’s one thing I look forward to during out-of-town works. It’s a bit pricey, though. My favorite combo is at Php165. I don’t drink beer, but I love cocktails. The most delicious Mojitos I’ve tasted so far are from Agave. They’re comparatively cheap too. Hanging out at Agave, just whining with my favorite drinking buddy, occasionally laughing at weird people we see, is my kind of a Saturday night…almost perfect with some music in the background. "Nothing But Desserts" has nothing but desserts. The name speaks for itself. You’ll find nothing but desserts here—delicious ones and very, very nice-looking, at that. The desserts look so good, you would have to think twice before munching on them. It is located in Smallville, Iloilo’s humble version of Eastwood (in my opinion). I discovered this place on my birthday. How apt, right? One of our staff in Iloilo brought us here to cap off my birthday. The desserts are so cute. They’re like pieces of artworks. The ambience is nice and comfy for a casual lunch or dinner. The crabs—very, very, very delicious. The price—hmm… a bit pricey compare to a lot of seafood places in this city, but let’s just say you’ll go for it because of the ambience. There is no Starbucks in Davao City, simply because they have Blugre. Before I became a fan of durian, I was a fan of durian coffee. Heck, if I can’t eat the fruit, coffee should be fine, right? There are a lot of branches of this posh coffee shop all over the city. There’s one in our office building and I always make sure I get a sip of their coffee whenever I’m in Davao. Foods, foods, foods… can’t get enough of them! This entry was posted in Vittles and Victuals and tagged bellini's, blugre, davao restos, dining out, estrel's, foods, gotti's, grab a crab, iloilo restos, italian, nothing but desserts, red kimono, restos, ya kun kaya. Bookmark the permalink.